130 Million. That's how many adults in the United States it would take to constitute a majority of American adults. I believe that at least 130 million adults in the United States would love it if there was a revolution to remove the rich from power and create an egalitarian society with real, not fake, democracy. I believe that this many Americans know very well that we live in a dictatorship of the rich, and they don't like it one bit. And these 130 million (at least) Americans include members of the American military forces. I have these beliefs because I've spent a whole lot of time on the street talking to strangers about this (as you can read about at www.PDRBoston.org ). But I also believe this: Practically none of these 130 million Americans shares my belief about 130 million Americans. Sure, they know that they personally would love an egalitarian revolution, but they believe virtually nobody else shares that view. This is why these 130 million Americans feel hopeless about making the fundamental change in our society that they know is required to really make a difference. Their hopelessness leads them to behave in a way that others mistakenly ascribe to apathy (not caring); they do care, they just don't see how they can do anything about what they care about. The American ruling class knows full well that it cannot make ordinary Americans love them and obey them enthusiastically. The opinion polls about Americans' contempt for politicians makes this obvious. So the ruling class relies instead on making Americans obey grudgingly, by making them believe that resistance is futile, because anybody who wants revolutionary change is all alone and hence powerless. The #1 propaganda theme of the ruling class is "Resistance Is Futile. You Are All Alone In Even Wanting to Resist and Have an Egalitarian Society." How does the ruling class persuade Americans to believe this #1 propaganda theme? Lots of ways. An important way is to exclude egalitarian revolutionary-minded people from ever being seen in the mirror of our society--the world of television and radio and magazines. About 75% of the people I ask on the street to sign an egalitarian revolutionary statement called This I Believe (posted on the website linked above) sign it if they stop to read it. And yet when have you ever seen a person in TV land expressing such views? The ruling class wants the NPR-listening folks to view the non-NPR-listening folks with a combination of contempt and fear, to view them as worse than the "enlightened" corporate/government elite now in power. So the ruling class has NPR and the rest of the mass media censor the reasonable views of the non-NPR-listening folks and only present their (supposed) views that will make them appear to be crazy dangerous bigots. The NPR-listeners are portrayed in the mass media as elitist social engineers who have no respect for the decent values of most people. Result? NPR-listeners fear the very idea of real genuine democracy because it would mean letting the bigots take over. And the non-NPR-listeners (courtesy of AM talk radio and the likes) are persuaded that the only people who are sympathetic to their concerns are people like Rush Limbaugh who advocate capitalism and inequality, not egalitarianism. Those who want an egalitarian society join the ranks of the hopeless who feel all alone. So! What should we do? Writing about how the bad people in power do terrible things doesn't really solve the problem, does it? Most people already know bad people in power do terrible things. They may not know about the terrible things that YOU care about, but they know about other terrible things from personal experience that you don't even know about. Telling them about more terrible things, or about how angry these things make you feel, doesn't solve the problem, does it? 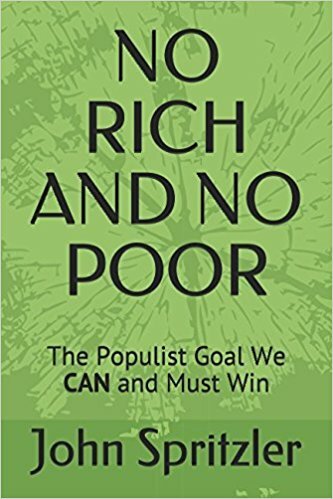 The problem (that we live in a dictatorship of the rich) can only be solved by lots and lots (130 or more million) people deciding to remove the rich from power (which they could certainly do, by the way, because they'd have support from members of the military forces.) But in order for this to happen, these 130 million people need to know that THEY ARE NOT ALONE, that there are 130 million of them (not a hopelessly small and powerless number) who want to remove the rich from power. To let these 130 million people learn that they are not alone is the purpose of the www.PDRBoston.org "Ring the Bells of Revolution" campaign. Maybe you'd like to help out?